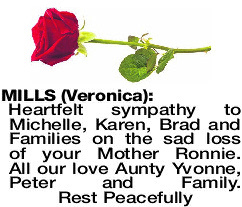 A Funeral Service to Celebrate the Life of the late Mrs Veronica (Ronnie) Patricia Mills of Bassendean will be conducted in the Chapel of Caversham House, 141 Caversham Avenue, Caversham commencing at 11.00am TUESDAY (02.04.2019). 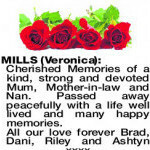 MILLS VERONICA Cherished Memories of a kind, strong and devoted Mum, Mother-in-law and Nan. Passed away peacefully with a life well lived and many happy memories. 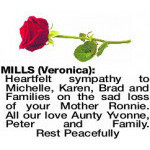 MILLS VERONICA With a broken heart I say goodbye Mum. You leave us with so many beautiful memories. 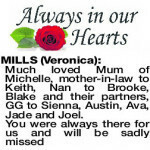 MILLS VERONICA Much loved Mum of Michelle, mother-in-law to Keith, Nan to Brooke, Blake and their partners, GG to Sienna, Austin, Ava, Jade and Joel. 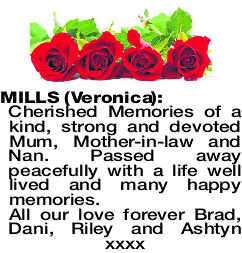 MILLS VERONICA In loving memory of our dearest Nan who was taken from us suddenly and all too soon. You will be terribly missed but always remembered. 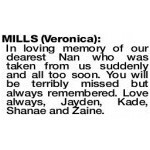 Love always, Jayden, Kade, Shanae and Zaine. "Ronnie", you were my cousin and close friend. You will be sadly missed. Sympathy to all Ronnie's family. Rob and Lee Wood. Fond and happy memories of Ronnie who was much loved and will always be in our thoughts. 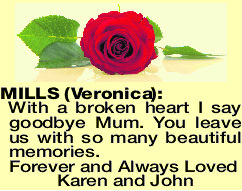 Our deepest sympathy to her loving family, with all our love, Lorraine, Kim and family. Many wonderful memories of our 67 years of friendship. Our families became close, our husbands best friends. Ronnie will be missed by us all. My friend, I hope you find peace at last. 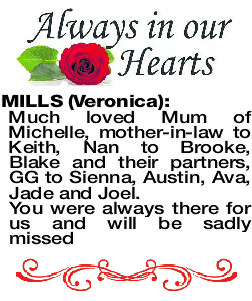 Love from the Baileys to the Mills family of Michelle, Karen and Bradley. 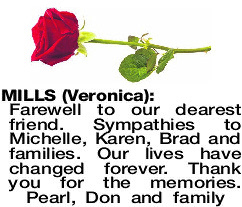 Our fondest thoughts as we share your loss. John, Fran, Mark, David, Jo-Anne and Godchild Linda. A 1945 school class mate who loved and cherished her family and friends. 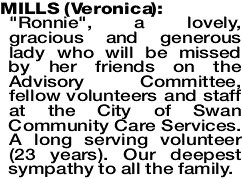 MILLS VERONICA "Ronnie", a lovely, gracious and generous lady who will be missed by her friends on the Advisory Committee, fellow volunteers and staff at the City of Swan Community Care Services. A long serving volunteer (23 years). Our deepest sympathy to all the family.